Both photo credits to Stephanie Conrad, Flickr. Thank you for the treat of these photos! It was the summer of a deep golden tan from hours at the blue chipped tile pool. A hundred years earlier, a homesick Brit had crafted a stone castle in America that perfectly matched his homeland. There was a tall curved ivy-wrapped clock tower, with hands that chimed away the hours too quickly. 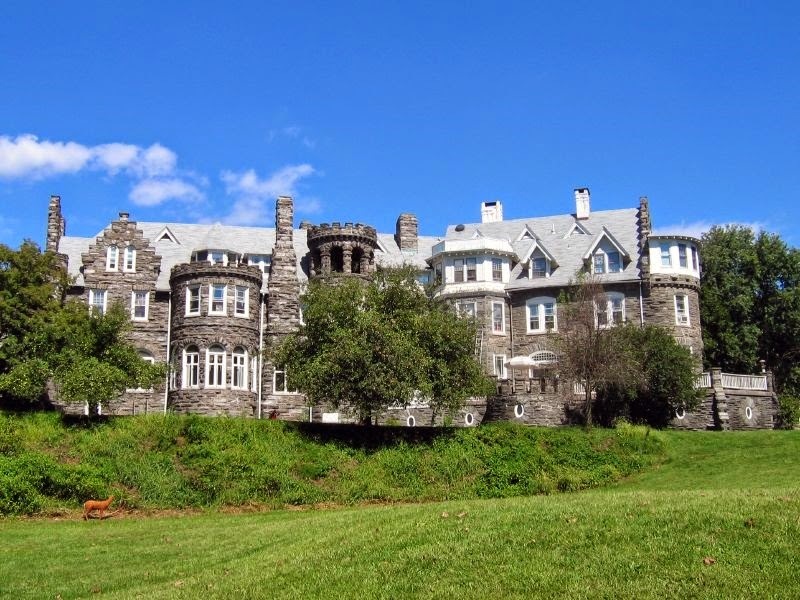 Two-story squash courts and an old carriage house stood across the circle from the full-blown castle, a three-story edifice that captured my imagination. There were two ramparted turrets, with balconies facing out, and two giant fireplaces that you could walk inside. Musty basements caverned wide and unending, with one or two rooms we called "dungeons." Were there bars on those windows? I can no longer remember. Waist-high stone walls chased the driveway all the way down a long curving hill, and a massive blue globe adorned the entrance. Tucked away in the forest, sunken mossy garden structures crumbled into stone boulders and sank into the undergrowth. I used to hitch myself on top the pebbly foundations, and carefully walk, balancing one foot in front of the other, pacing through the forgotten city and reciting poetry to myself. 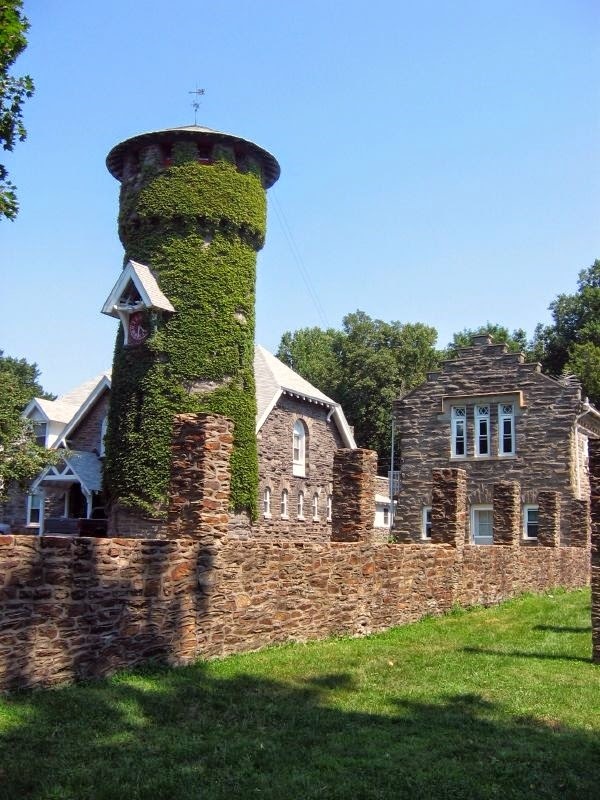 It was the summer of late-night hide and seek games, all-day volleyball on the grass before jumping into the pool, and hours with teen friends my age who lived on this castle hill too. We built bonfires, drank gallons of ice tea from the community dining hall between the two fireplaces, and hiked early morning treks into wooded glens. A spring twilight here in the present bleeds rose across the sky, and tangerine streaks smudge the horizon, trailing navy and the image throws me back to this high school summer oasis. I can picture the turreted castle, the clock tower, and summer days that stretched deliciously long. I was Jeni then, petite brunette with sun-bleached orange highlights from a Sun-In spray gone wrong. Time passed, and my name changed to Jen. College and my twenties swirled and blurred. Later, copying my sister and cousin who were choosing more professional monikers, I picked up my full name, shyly trying it out and tasting it on my lips as I said it to new acquaintances: Jennifer. There are still people who know me as Jeni/Jenny, Jen, and Jennifer, and I'm still that person. The names we use tap into shared histories, don't they? I'm sure you can think of one or two names that people have for you, pet names that speak of a shared story, or shared timelines. In my Bible reading this week, I've been mulling over watching Jesus pray. Eavesdropping into his private conversations in the upper room, I peek into how he prays for himself, how he prays for his close eleven friends/teammates, and how he prays for future people who will love him. I've been curious to see what he would ask, what he would say... and I discovered something new tonight. In John 17 verses 11 and 25, Jesus brings up two new names of God that appear nowhere else in the New Testament, study notes say. Intrigued? I was too. What names of God the Father would he use? What new names did he choose as he was baring his heart to the Father before going to his death in the next scenes? "Holy Father" and "Righteous Father." Wow. Our names for each other-- and for God-- show our history with them. I'd never heard this before. Thanks for sharing. So true. Names say a lot about our history. Sometimes an old name can bring back a moment or image as quickly as smell. Amazing that Jesus focuses on God's holiness and righteousness in his moment of need. Magnificent. I didn't realize either that those were "new" names in John 17 never before used. Cool--I'm glad you pointed that out. Jennifer, who better to know what to call the heavenly Father then His Son. You have been studying my sister. Full name Betty Jo, family and friends I grew up with called me Jo and still do. Husband family always called me Red since I had red hair. But I love being called child of God...good post. I didn't catch that! Thanks for that! I did catch the part where He called His disciples His friends. How amazing is that. To be a friend of God. Great lesson and one that is making me think into the names and nicknames. Well done... Jen! How easily we read the words printed on the pages, but don't really consider them or their meaning or who said them. Thanks for sharing and reminding me how important each word of the Bible really is. Hi Jennifer. Thanks for sharing. This reminded me of what a beautiful and magical place we call home! And it brought back lots of memories of those summers playing together here. I'm encouraged to see how God's speaking through you. Hope our paths do cross some day soon! We would have a lot of years to catch up on!